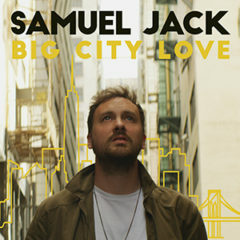 Samuel Jack has released his new single Big City Love. “Big City Love is a love letter to the city! It’s about leaving your troubles behind and chasing your dreams. I’ve spent my life in and out of cities – they’re uniquely different, and from where I live, the depths of the countryside in a Caravan, I find myself inspired and invigorated by how alive everything feels, I just love the romance of it all, the bright lights, the people chasing their dreams amongst the hustle and bustle. I wrote the song in Los Angeles, my heart fueled with excitement and adventure but in a way, it’s about all the cities that I’ve immersed myself in, a melting pot of memories, aspirations and potential” explains Samuel. To celebrate the release Samuel and his team will be spreading thousands of love letters with positive messages throughout iconic spots in Amsterdam and London. Stay tuned by following #bigcitylove and you might even find a love letter in a spot near you. The single is now available on all streaming and download platforms. Samuel will be visiting the Netherlands again in September! See the full tour schedule below for more information.